GIA exists to protect all purchasers of gemstones, by providing the education, labratory services, research , and instruments needed to accurately and objectively determine gemstone quality. Most of our staff is accredited through GIA as Accredited Jewelry Professionals. We are proud of our commitment to furthering our own education so we can properly inform you, the customer. With a mission to increase consumer confidence in the jewelry industry, Jewelers of America advocates professionalism and adherence to high ethical, social and environmental standards. Our Code of Professional Practices and position statements on issues of importance to consumers illustrate our deep commitment to responsible business practices in the retail jewelry industry. We have multiple employees at Aaron's Jewelry certified through Jewelers of America. We are committed to excellence and continued education which keeps us at the forefront of jewelry industry innovations. Until recently, the jewelry industry was almost completely unregulated and standards of competence were nonexistent. A national organization, the Jewelers of America (JA) saw the need for standardization and set up a testing system to determine a bench jeweler’s level of expertise. There are four levels of testing from Entry Level Technician up to Master Jeweler. The Master Jeweler exam requires approximately 40 hours to complete, and consists of the creation of three highly complex jewelry pieces and a written test. The three pieces are made according to exact specifications, and strictly graded on 146 different points. The projects have been specially chosen to test the jeweler’s artistic judgment, knowledge of materials and techniques, efficiency, and skill as a craftsman. The 2-hour written test covers gem treatments, safety issues and technical knowledge. 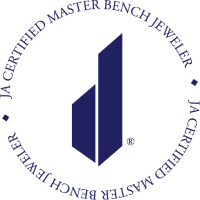 We, at Aaron's Jewelry, are very proud to be THE ONLY retail jewelry store in the state of Utah to employ a Jewelers of America Certified Master Bench Jeweler*. Our Master Jeweler, John Wintle, earned his certification in 2012 and continues to strive to perfect his art. With over 15 years at the bench John is but a portion of our HIGHLY SKILLED team of bench jewelers including Gary Yardley and owner Jay Fluckiger. For the highest quality craftmanship and service, ensure that your chosen jeweler is an industry leader and certified through professional organizations such as Jewelers of America and/or The Gemological Institute of America (GIA). Offers coverage for jewelry businesses in retail, repair, custom design, jewelry appraising, wholesale, and manufacturing.Provides coverage for individuals' personal jewelry for residents throughout the U.S. and CanadaIs licensed in all 50 states and in Canada (except Québec).Earned an A+ financial rating from A.M. Best for more than 20 years.